Parking lot striping may not be the first thing on your mind while driving, but having a freshly striped parking area in Miami is a great way to have your business stand out and look amazing. We know that patrons to your business notice when your exterior looks great, and they also appreciate the fact that you have taken measures to ensure their safety. You may not associate a striped parking lot with safety, but the fact of the matter is that if vehicles know where to park, where not to park, where people will be crossing, and also the direction the traffic should flow, it will really keep your patrons safe while walking, and also keep their cars safe while they are inside. 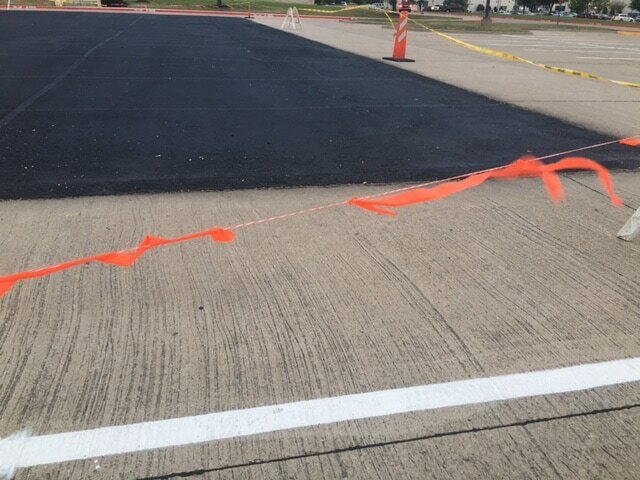 Our experience with striping parking lots is evident in the quality of work that we produce. We take pride in revamping your parking area and making it look new again. We do not skimp on the details and we use the highest quality traffic paint, and striping equipment to ensure an excellent striping job by the time we are finished with the project. Ensuring line thickness, both width and height as well as uniform color is important to us and makes for great looking results in your parking lot. Keeping your parking lot up to code, and also well maintained can be a daunting task if you have to do it alone. Never fear we are ready to assist and become your go-to parking area maintenance contractor. We provide excellent customer service and professional crews with great experience. Painting straight lines does take skill, knowledge, and experience, and we possess all three of these qualities. We know you will be more than happy with the professional service we will provide to you. We are a full-service parking lot maintenance company, and no matter what type of services you need to be completed in your lot, we are here to help. We work with both asphalt and concrete surfaces and know how to properly maintain both. Being that we are a full-service company we can take care of the smallest of things like parking lot sweeping all the way to full-blown parking lot repairs. One of our professionals will be able to discuss with you all of our services at length if necessary. We also take your schedule into consideration. We will work with you or your business manager to ensure that our work will not disrupt your normal flow of traffic. If you have a very busy parking lot, we can do the striping during the evening hours when the lot will be empty. This is something we can discuss with you and schedule, prior to us starting the work. Fire Lane safety and compliance is not an option if your business fits the guidelines of being required to have a fire lane striped around the perimeter of your parking area and building. Our crews know all of the fire codes, and will make sure that your parking area meets all the requirements necessary so your business will pass inspection. 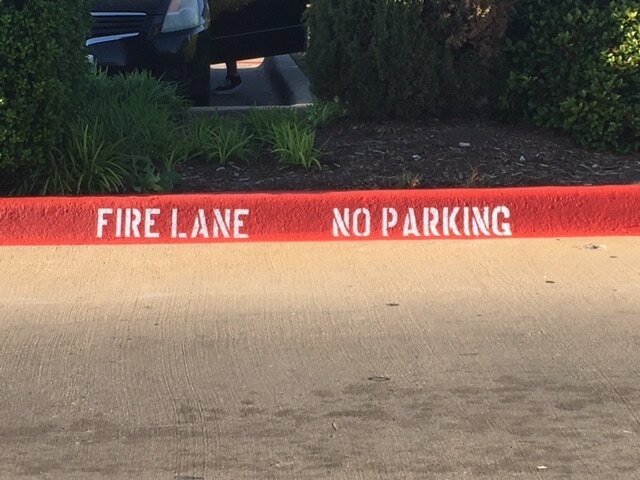 Keep in mind all firelanes once painted must continue to be maintained, so if you have an older parking lot, you should keep the fire lanes painted, so you do not receive a visit from the local fire marshal. If you do find yourself out of compliance, give us a call and we can easily come out and stripe all of your firelanes. We take our striping job serious and knowing all of the fire codes is important to us, so we can help you maintain a safe environment for everyone. Contact us today and we will be glad to come out and stripe your fire lanes. 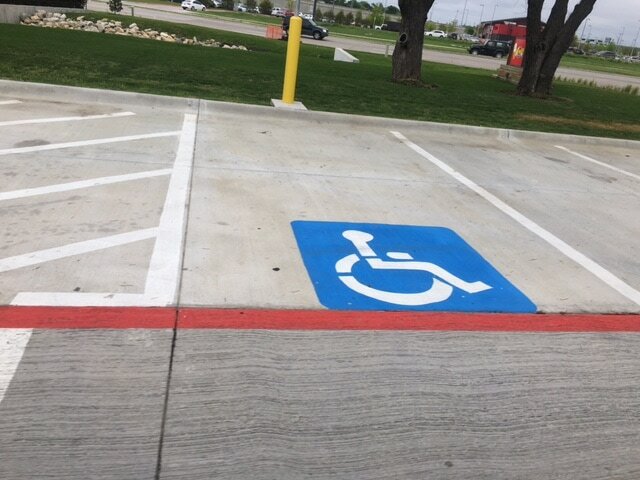 When it comes to marking, stenciling, and striping handicap parking spaces there are some very specific rules and guidelines that must be followed. These guidelines were put in place in 1990 by The American Disabilities Act (ADA). You as a business owner must stay compliant and follow all of the ADA handicap stall rules in order to pass inspection for your parking lot area. We have all of the proper ADA required stencils, and we can install proper signage to meet all requirements as well. The number of handicap parking spaces you need in your lot is determined by a number of square feet you have in your parking lot and the number of utilized parking spaces that will be used in the space. You may also be required to have van accessible handicap spaces as well. Our professional stripers will make sure your parking area is fully compliant by the time that we are finished striping your parking lot. We are experts and we take compliance very seriously. Contact us today for a FREE quote, and we can discuss all ADA compliance questions you may have. ​Property damage can occur by vehicles in the parking lot by accidentally running into buildings, walls, other vehicles, sidewalks, fences, etc. Once wheel stops are installed there is a reduction in the type of damage that will occur from rogue vehicles. Wheelstops do need to be installed properly to ensure the safety of pedestrians as well. When installed properly in the parking stall, the stop should be completely covered by the vehicle occupying the space. Once space is unoccupied the wheelstop can be a tripping hazard, thus requiring extra precaution to be taken to ensure the additional safety for the patrons to your parking area. The type of wheel stop you install should be dictated by the types of vehicles parking in your lot. For instance, if you are dealing with passenger vehicle traffic than concrete or rubber parking blocks should work exceptionally well. However, if your parking area caters to large trucks or 18-Wheelers then concrete wheelstops will break apart in no time as they cannot stand up to the pounding they will endure under the wheels of the truck. You will need to look at having steel wheel stops installed which will last forever as they are indestructible. No matter the types of wheelstops you choose, we are ready to professionally and properly install the wheel stops in your parking lot. ​Wheelstops should be installed in the parking stall so that when a vehicle is parked in the stall the entire wheel stop is covered by the vehicle. Wheel stops also need to be painted so that they contrast with their surroundings in order to help prevent tripping by pedestrians walking in the parking area when a vehicle is not parked in the area. Proper lighting can also help with safety issues regarding the wheelstops. Speed bumps, we love them and we hate them as drivers, but they do serve a purpose and that purpose is safety. As a business owner, you know the importance of keeping your patrons safe. Controlling the speed of traffic is a huge way you ensure the safety of the folks visiting your business. You will see fewer issues of cars crashing in your parking lot and hopefully, will never see a pedestrian getting struck by a vehicle. You need to make sure that speed bumps are properly visible with bright reflective paint so drivers see them in advance and slow down, as hitting a speed bump at a high rate of speed could easily damage a vehicle. They also need to be visible to pedestrians walking from their cars to your building. You do not want people tripping over the speed bumps either. Our professional installers can install new speed bumps in your parking area, or advise on the best way to maintain your current speed bumps. We also do removal service if you need to get rid of your speed bumps or simply replace them with new ones. Speed bumps are typically made from asphalt, concrete, or rubber. There are other materials used to make speed bumps, so if you need something specific simply ask and we can assist you with the best selection for your budget and parking area. Let’s face it, vehicle accidents happen in parking lots all the time. Adding an extra barrier of protection to your building and pedestrian areas is always a good thing, and your patrons will respect you for helping to protect them while they are visiting your business. Bollards although typically small, provide a great amount of protection when installing properly and in proper areas. If your building, sits right in the parking lot with no types of sidewalks or grassy area between the building and the parking lot then bollard installations will be necessary around specific areas of the building. Even if you do have a walkway or grassy area, you will most likely want bollards near the entrances and crosswalks to protect from accidents. Bollards can also be decorative and include lights to help illuminated dark areas. These decorative bollards, provide safety and also look great when the design complements the architecture of your building. Our professional stripers are also experts when it comes to installing bollards. 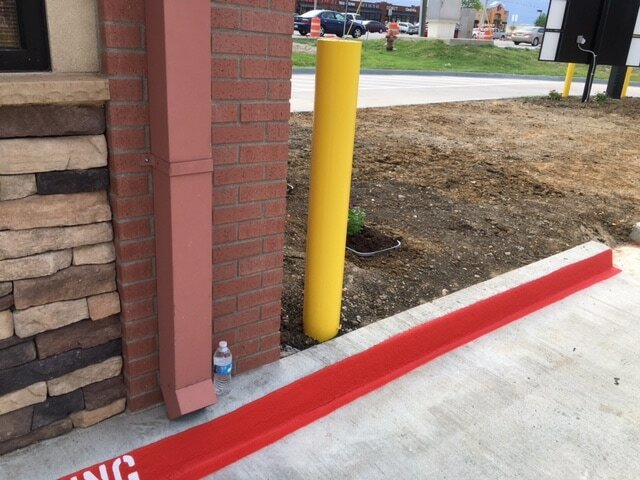 We can assist you in pointing out areas that would benefit greatly by having bollards installed. Once we know exactly what is needed we will properly install and the bollards. Sealcoating adds an extra layer of protection to your parking lot which will keep your parking lot functional and last a very long time. When the asphalt contractor laid your parking lot, they should have advised you that within the first year you should apply a sealcoat to the surface. It is advised that a new layer of seal coat be added every 2-3 years following. If you keep up with this type of maintenance schedule your asphalt parking area will last a very long time. The sealcoat will do a few major things that make a huge difference. First off it adds weatherproofing to surface by filling in small cracks and preventing water from seeping down into the base of the asphalt. If water does begin to collect in the base, you will experience oxidation and deterioration which will cause your asphalt surface to fail. So adding this weatherproofing protection is huge. The second thing is that the seal coat now becomes the top wearable layer. When vehicles drive on the surface and turn their wheels, it will slowly break down the top layer surface. This breaking down is called abrasion. Since this abrasion is occurring to the top layer that means the bottom layer of asphalt remains unharmed, thus resulting in a longer lifespan. The main visual aspect of seal coating is that once applied your parking lot will look brand new. 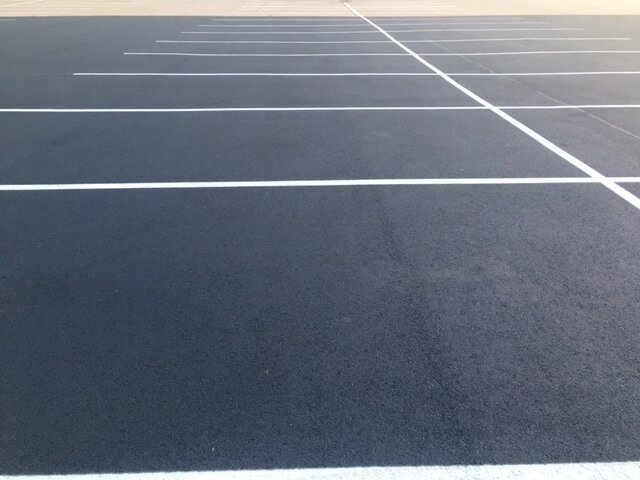 The deep black coloring contrasted against the fresh striping will absolutely look amazing and you will reap the benefits of everyone thinking you have a brand new parking lot. Helping to keep Miami beautiful is what we do best. We love servicing all businesses in the area and adding you to our trusted client base. We know the best compliment that we can receive is to have you refer us to your friends and neighbors and we work very hard to earn your trust. We know that our expertise and professionalism will show through in every job that we do. Here is a list of the types of businesses we serve on a daily basis. If you do not see your business listed here, but you do in fact have a parking lot or warehouse we will be able to assist you for sure. Let us know if your business type is not listed here and we will be sure to add you to the list. 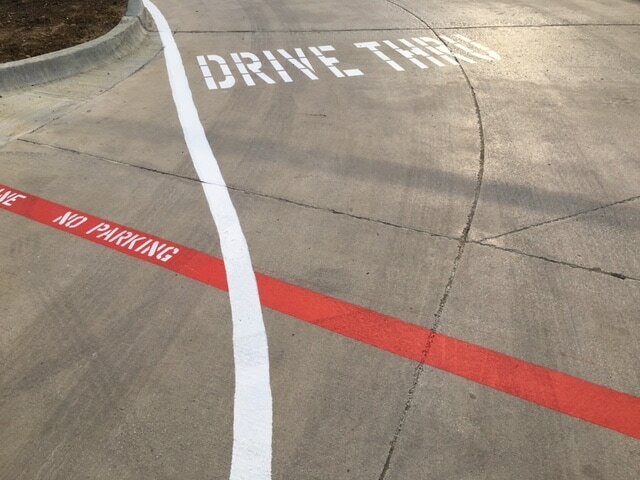 We understand that costs can be a huge factor when choosing a parking lot striping company. We have the most competitive prices in all of Miami and look forward to providing you with a FREE quote to complete your project. Give us a call, to discuss what you need to have done on your property and then we will schedule a time to come out and take a look at the property so we can give you the most accurate quote possible. Our goal is to make happy customers and to continue to keep Miami looking great one parking lot at a time.